Heavy showers in the Peak District. Also some good spells of sunshine. Jan’s sister Lynne and husband Peter were staying the weekend so went for walk to 3 Shire Heads. Much less water at the falls than 2 weeks ago. Then on to Church Inn in Chelmorton. Tonight we walked over Eccles Pike to Old Hall Inn to meet Rob and Annie. 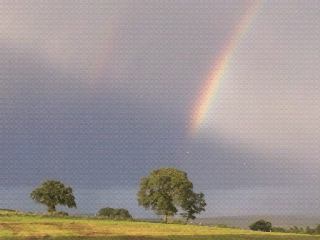 Heavy rain on way as well as good rainbows. Photo taken on Samsung Galaxy S2 mobile. Too colourful for my proper camera!